Plum wine is a sweet alcoholic drink made from ume plums native to China. China introduced the ume plum to Japan in the sixth century, and plum wine became a popular drink in Japan during the 17th century. 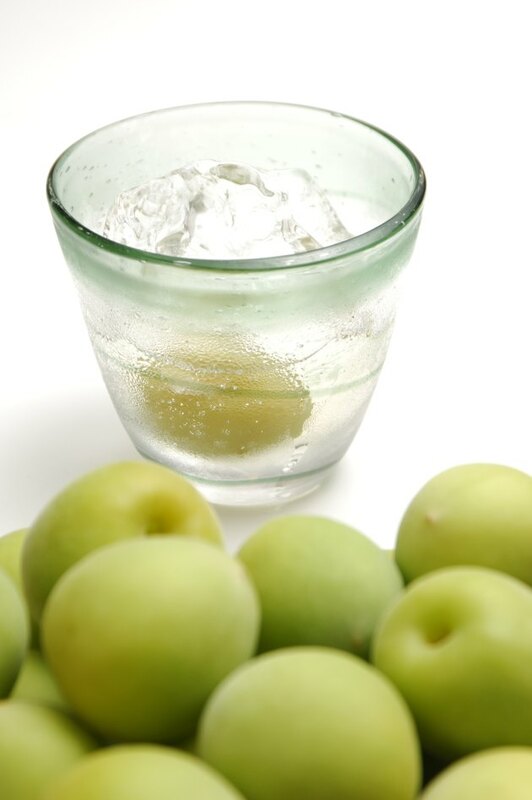 Today, typically served chilled as an aperitif, Japanese plum wine is a popular drink in Japan and worldwide. Plum wine may offer certain health benefits, but only when you enjoy it sparingly. Besides alcohol, plum wine contains several healthful substances, including essential minerals and antioxidants. A study published in "Journal of Food Composition and Analysis" in 2007 analyzed the antioxidant and mineral content of various fruit wines and traditional red wines made from grapes. Researchers found that plum wines had a moderate total antioxidant capacity, similar to those of cherry and raspberry wines, but less than wines made from grapes or blueberries. Essential minerals including calcium, magnesium, manganese, zinc, iron and especially potassium were also present in the fruit wines as well as the red wines. Plum wines and other fruit wines were found to contain significantly less headache-inducing histamines than red wines. If consumed in moderation, the alcohol itself in plum wine may also confer certain health benefits. A Japanese producer of plum wine says its plum wines have an alcohol content of about 12 percent, which is similar to that of red or white wine. Moderate consumption of alcohol may provide reduced risk of developing heart disease; reduced risk of dying from a heart attack; reduced risk of strokes, particularly ischemic strokes; reduced risk of gallstones; and, possibly, reduced risk of diabetes. "Moderate" alcohol consumption, as defined by the 2010 Dietary Guidelines for Americans, means a maximum of one drink per day for women and two drinks daily for men. A standard serving of wine is 5 oz; however, it being a sweet dessert wine, a standard serving of plum wine is only 4.1 oz. As with all alcoholic beverages, plum wine is a significant source of calories. Alcohol provides 7 calories per gram -- more calories than carbs and protein and second only to fats, which have 9 calories/g. Plum wine also contains 20 g of sugar, or 6 percent of daily carbohydrate needs, per 4.1-oz. serving, according to Livestrong.com MyPlate. With its moderate alcohol content and high sugar content, a 4.1-oz. serving of plum wine contains a total of 163 calories. For comparison, a 5-oz. serving of dry red or white wine contains only 100 calories. Therefore, if you consume plum wine in excess, it could quickly lead to weight gain and related health problems, as well as health problems related to excessive alcohol consumption. Although plum wine may offer some health advantages when you drink it in small amounts, the potential health benefits of the drink are far outweighed by the health risks of alcohol when you binge drink, or imbibe several drinks within a few hours. Habitual overindulgence of alcohol puts you at risk for numerous health problems, including high blood pressure, certain cancers, suicide, accidental serious injury or death, cirrhosis of the liver, pancreatitis and heart failure. The health risks of even moderate alcohol consumption may outweigh the benefits for some people. Avoid alcohol entirely if you are pregnant or trying to become pregnant, planning to drive a vehicle or operate machinery or taking medications that interact with alcohol. Are There Any Health Benefits of Vodka? How Many Calories Are in Stella Rosa Wine? Can You Lose Weight by Drinking Red Wine?